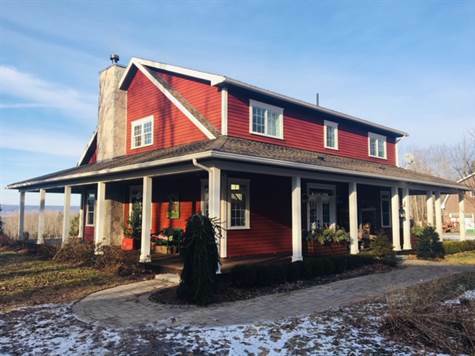 $898,000 Valley Views on 23 Acres! Vast Annapolis Valley views can be yours from this executive, custom built, 10-year-old home, nestled on 23+ acres of field and forest, ( 7 acres field) located just 10 minutes from CFB Greenwood or 20 minutes to Kentville. Road frontage and zoning allows for subdivision. This property features a detached two car garage, (32x36) with a drive thru door and a finished guest suite above with half bath. There is also a 40x28, heated with heat pump & wired 2 storey barn (currently set up as a wood working workshop. Tools and machinery available for sale over and above purchase price). Dry storage shed 12x16 is steps away. The outdoor space is complete with over $225,000 invested in professional landscaping, hardscape design, and a saltwater pool to create a private, relaxing haven with finished ‘she-shed’ and covered deck that is perfect for entertaining. Light lovers will appreciate this home transoms and accent lighting as this home was designed to embrace natural light and feelings of comfort with an open concept main floor, cathedral ceilings, inviting fireplace with live edge maple mantle and walnut hardwood floors. The Chef’s kitchen features Thermador Professional series appliances include gas range with grill and griddle inserts, and wall oven with warming drawer. There is a ton of smart storage with the custom cabinetry, display cabinets, and quality Moen fixtures including pot filler and garburators. To top it all off, of course, are granite countertops and a breakfast island with an additional dual sink and distressed accent paint on the base. Open concept flows from kitchen to spacious dining area and then to a light-filled and inviting living room with stone fireplace and live edge maple mantle. Main floor master bedroom features custom walkthrough closet with dedicated drawers and lighting, and stunning 5 pc en-suite with double granite vanity, free standing soaker tub and rain shower head. Laundry, 2 pc bath with porcelain floor tiles, thoughtful storage and in-floor heat complete the main level. 2nd level features two large bedroom each with lighted double closets. A 4-pc bath with in floor heat, and spacious family room complete this level. Home has wired in sound system, motion detection security system and propane, 20-kw generator. Must be viewed to appreciate these sellers’ attention to quality finishes, functionality and making a family friendly home-And even an easy 1 ½ hr. drive to HFX airport!